When I was a kid, I saw my friends dad open up his audio cabinet for the first time to put on a movie for us and there I saw a huge array of LEDs come to life as the 20th century fox tune blasted through the speakers, I was mesmerized as the bars danced in time to the audio. That was my first love of VU meters, and now that I'm 20years older and earning a bit more then a paperboy in the 90's. I to want to have my own multi channel UV meter display. On aliexpress I found a "VU Meter Level Indicator Amplifier Board Dual Channel 32 LED MCU Adjustable Display Pattern LED"
I'm wondering if anyone knows of a board or circuit that will take an audio feed from a stereo jack, and out put a feed suitable for one of these modules. 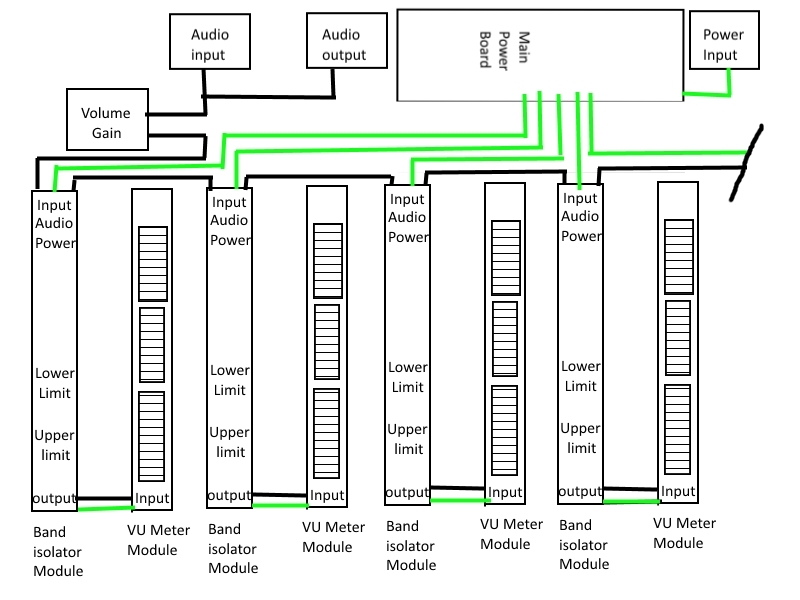 It would need a tune-able upper and lower cut off threshold, so that one board and module can control one frequency band of of the audio spectrum. This way one module can be set for a certain band by playing a tone and tuning that board and my hope is that it can be scaled so you can have as many bands in the VU meter that you want 4,8,16,32 and my hope eventually, 64 band. The Ali Chinese VU meter has no spec's. Its dB's per segment are unknown. Are the 8 highest LEDs all red? It is unbelievable that its maximum input is 101W to 130W. Then with a normal much lower input level it won't show anything. Why do you want to see the levels of many bands of frequencies? Many bands will show nothing most of the time. My VU meter has only one bar of LEDs that show the level of all frequencies and it has a microphone to show all sounds. Then my hearing tells me if the frequency of a sound is high pitched or is low pitched. You certainly do not need 64 bands, 7 bands of frequencies are plenty. Each frequency selecting circuit needs an opamp plus some resistors and capacitors. yes there are 3 green bar LED blocks and one red one. I'm not worried about having an accurate value for the DB in each band it is only meant as a rough visualization. The bands wouldn't have to be all different for each module, you could only have 32 bands but have 2 modules for each, that I think is the cool part of having them tune-able, and they whole concept scale-able for how ever many bands or modules you want to have. Is what I'm looking for basically an adjustable RCL band pass filter? Check out the data sheet for the LM3915/6 devices. That should give you a clue. I think there is a basic spectrum analyser display in the NatSemi data sheet, which appears to be what you are after. and then control the amplification of that frequency to feed into the LED module which should only light up when that frequency plays in the audio. Seems like you are simply trying to make a crude spectrum analyser with an LED display? If so there are easier ways to do this than by building and tuning dozens of bandpass filters e.g. using a microcontroller to digitize the signal and perform an FFT. There are dozens of projects like this on the web if you have a search, and there are several kits to build your own from China e.g. 11x12 LED, 32x32 LED.